Eurythmics were one of the most successful duos to emerge in the early ’80s. Where most of their British synth pop contemporaries disappeared from the charts as soon as new wave faded away in 1984, Eurythmics continued to have hits until the end of the decade, making vocalist Annie Lennox a star in her own right, as well as establishing instrumentalist Dave Stewart as a successful, savvy producer and songwriter. Originally, the duo channelled the eerily detached sound of electronic synthesizer music into pop songs driven by robotic beats. By the mid-’80s, singles like “Sweet Dreams (Are Made of This)” and “Here Comes the Rain Again” had made the group into international stars, and the group had begun to experiment with their sound, delving into soul and R&B. As the decade wore on, the duo’s popularity eroded somewhat — by the late ’80s, they were having trouble cracking the Top 40 in America, although they stayed successful in the U.K. During the early ’90s, Eurythmics took an extended hiatus, as both Lennox and Stewart pursued solo careers. 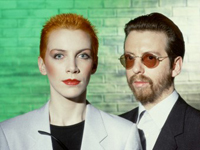 The origins of Eurythmics lay in the Tourists, a British post-punk band of the late ’70s formed by Lennox and Stewart. The pair met in London while she was studying at the Royal Academy of Music. Stewart had recently broken up his folk-rock group Longdancer and was writing songs with guitarist Pete Coombes. Immediately after meeting, Stewart and Lennox became lovers and musical partners, forming a group called Catch with Coombes, which quickly evolved into the Tourists in 1979. Though the band only was together for two years, the Tourists released three albums — The Tourists, Reality Effect, and Luminous Basement — which all were moderate hits in England; two of their singles, “I Only Want to Be With You” and “So Good to Be Back Home Again,” became Top Ten hits. During 1980, Lennox and Stewart’s romantic relationship dissolved and, along with it, so did the Tourists. Though they were no longer lovers, Lennox and Stewart decided to continue performing together under the name Eurythmics and headed to Germany to record their debut album. Featuring support from various members of Can and Blondie drummer Clem Burke, among others, the duo’s debut, In the Garden, was released in 1981 to positive reviews, but weak sales. Following the failure of In the Garden, Stewart set up a home studio and Eurythmics recorded a second album, Sweet Dreams (Are Made of This), which was released in 1983. Released in the spring of 1985, Eurythmics’ fourth album, Be Yourself Tonight, boasted a tougher, R&B-influenced sound and featured a duet with Aretha Franklin, “Sisters Are Doin’ It for Themselves.” The duet became one of three hit singles from the album, in addition to “Would I Lie to You?” (number 17, U.K.; number five, U.S.) and “There Must Be an Angel (Playing With My Heart)” (number one, U.K.; number 22, U.S.). Revenge, released the following year, followed the R&B and soul inclinations of Be Yourself Tonight to a harder-rocking conclusion. Though the album peaked at number 12 in the U.S. and spawned the number 14 hit “Missionary Man,” its sales were noticeably weaker than its predecessor. In the U.K., the group was slightly more popular — “Thorn in My Side” reached the Top Ten — but it was evident that the group was past the point of its peak popularity. As appropriate for a group passing their commercial pinnacle, Eurythmics began branching out into other areas. During 1985 and 1986, Dave Stewart produced a number of superstars, including Bob Dylan, Daryl Hall, Tom Petty, and Mick Jagger. Annie Lennox began a short-lived acting career, appearing in Revolution. Eurythmics reconvened in 1987 to release Savage, which was greeted with mixed reviews and weak sales. That same year, Stewart married Siobhan Fahey, a former member of Bananarama who had also appeared in the “Love Is a Stranger” video; she would later be a member of Shakespear’s Sister, which was produced by Stewart. In 1988, Lennox had a hit duet with Al Green with “Put a Little Love in Your Heart,” taken from the Scrooged soundtrack. The following year, Eurythmics released We Too Are One, which sold well in Britain, reaching number one, but poorly in America, despite “Don’t Ask Me Why” becoming their first Top 40 hit since “Missonary Man.” Furthermore, the reviews were decidedly mixed on the album.